There are now so many CSI TV series that there'll be a new CSI Something-or-other DVD release every month from now until October. 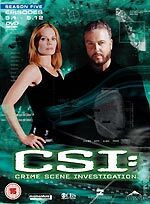 Next up is CSI (or CSI: Vegas, if you prefer) - Series 5 Part 1, which will be released on April the 24th. The three-disc box set will feature the first twelve episodes of the series, which was originally shown in 2004-5. Bonus features include five episodes with audio commentaries (on Viva Las Vegas, by Danny Cannon and Carol Mendelsohn; Down The Drain, by Ken Fink and Naren Shanker; Formalities, by Dustin Lee Abraham and Naren Shanker; Who Shot Sherlock?, by Rich Catalani, Ken Fink and David Rambo and Snakes, by Richard J. Lewis, Dustin Lee Abraham and George Eads); The Research Of CSI. - Maintaining The Accuracy featurette (10m); and CSI. - Procedures On The Scene And In The Lab (an eight-part featurette, 19m). The RRP is £39.99. Season 5 Part 2 will be released on June the 26th. CSI: NY - Season 1 Part 2 was released this week. To nobody's great surprise, Contender has brought forward the release of the BBC's hit drama series Life on Mars. It will now be released on May the 15th. More details of the disc can be found in the title's Incoming entry. We have two new competitions, and two new reviews for you today! The new reviews are of Arrow Films' two-disc Special Edition of George A. Romero's unconventional vampire movie Martin, and 2 Entertain's latest Doctor Who DVD, Genesis of the Daleks. Click on the sleeve images, right, to go to the review pages. Ceri has updated the Offers page this week. There you'll find all sorts of bargains, including good pre-order prices for the new David Tennant Doctor Who DVDs, a bountiful Chronicles of Narnia: The Lion, The Witch and the Wardrobe box set that's exclusive to Amazon.co.uk. and some terrific prices on Network releases, including Budgie, courtesy of HMV. If you haven't visited our swanky new Incoming database yet, please do. It's constantly being updated with newly-listed titles, usually long before they're announced officially. You'll also be able to spot bargains at trusted online etailers. 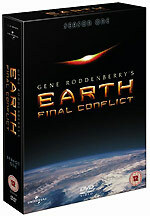 The first season of Gene Roddenberry's very successful 1997-2002 science fiction series Earth: Final Conflict will be released on DVD in the UK on April the 3rd. The six-disc set will feature twenty-two episodes, including series opener Decision. The series starred Kevin Kilner as former Police Officer William Boone, who is recruited to work for an apparently benevolent alien race, the androgynous Taelons, who arrive on Earth early in the 21st century. The series also features Roddenberry's widow, Majel Barrett. The RRP for the set is £34.99. There are new dates for two of the re-mastered Gordon Murray titles: Camberwick Green will now be released on May 8th, and Chigley on June 19th. The latest updates can be found here: Chigley, Trumpton and Camberwick Green. That's all I've got time for today - more soon!